When English poet Geoffrey Chaucer wrote, “Time and tide wait for no man,” he lived during the Middle Ages. Back then, life expectancy was 45 years old, thanks to disease, like the bubonic plague, and low infant mortality rates. With the vast, modern improvements in healthcare, hygiene, and diet, populations today can expect long, healthy life spans. But living longer has an impact elsewhere, including on the economy and division of labor and care. 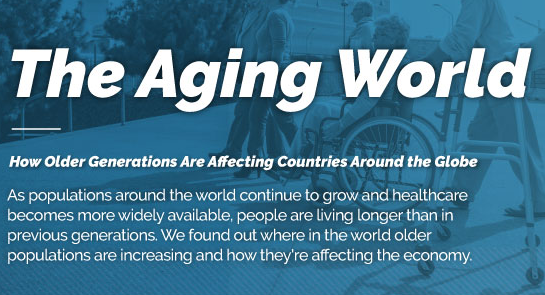 Check out the infographic below to see where older populations are increasing and how they’re affecting the economy. In 2012, the global population reached 7 billion, with 8% of those people aged 65 and over; by 2015, the older population rose by 55 million. This means that over 8% of the population is considered not part of the workforce, so fewer taxes are collected and there are fewer contributions to the Gross Domestic Product (GDP). Aging populations also mean more dependency on basic and social services, such as healthcare, affordable food, and appropriate housing. With finite resources, many countries are feeling squeezed. According to the graphic, the older population is projected to double to 1.6 billion globally from 2025 to 2050, however, the total population will grow by just 34% over the same period. This means that the balance between those who are able to contribute to a country’s economy and be in good enough health to not rely as heavily on social services will not grow at the same rate as the older generations, leaving an imbalance of resources available. Adding to the disparity is the question of who will care for and attend to the aging populations. Many middle-age adults find themselves stuck between caring for their children while simultaneously caring for their parents or elderly relatives. Some countries have a worrying outlook for the number of people available to care for the aging population. In 2015, Japan had the highest ratio of aging population, where 30% or more were 60 years or older. By 2050, the number of countries expected to meet that 30% ratio will balloon to include Canada, nearly all of Europe, much of Asia, and parts of South America. Countries, like Japan, Italy, Germany, France, Spain, the UK, Poland, and Canada, with the least amount of younger generations, face a difficult task of figuring out how to maintain a balance between providing for new generations and taking care of older generations. Chaucer’s original thought rings true for today’s countries: Time does not wait. As populations around the world continue to grow, so must the options and resources available to maintain healthy, prosperous economies and lifestyles. It is the legacy of each generation to figure out how to care for the previous and set up the next population for success.